Hi everyone!! 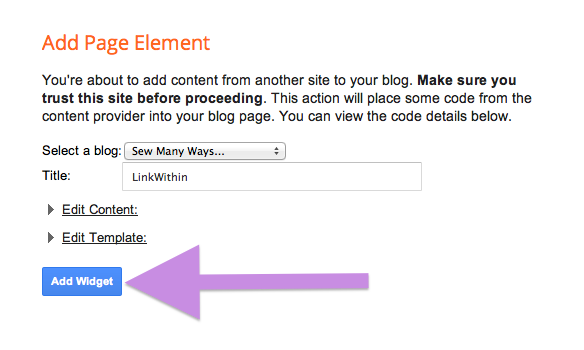 Thought I would share another blogging tip...how to add a gadget at the end of each post called LinkWithin. When someone stops by your blog, some days you have their attention just for a brief moment before they click on to the next blog in their long lists of blogs to read. You wish they would stay longer and browse through your older posts and read further , but let's face it...time is precious to all of us and we need inspiration or a little guidance. Well, I added this gadget a few years ago to the bottom of each of my posts after found myself using it on the blogs I was reading. 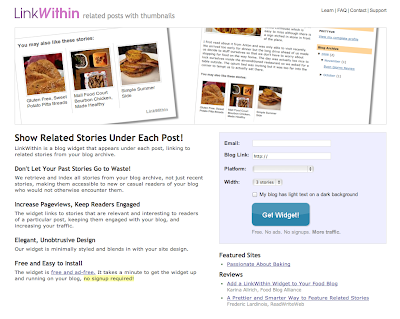 This gadget shows picture links to older posts to grab your readers attention on posts they may have missed in years past. The gadget is called LinkWithin. I have no affiliation with them...I just want to share it with you! Here is a post I did this week about adding a binder clip to my wallet to keep the credit cards from slipping out. The images below are screen shots. This is what the post looks like at the beginning. This is what the post looks like at the end. See after where I signed my name? It says..."You might also like:"
On any blog, if they have LinkWithin, the word I circled in this picture is always a link to their site. 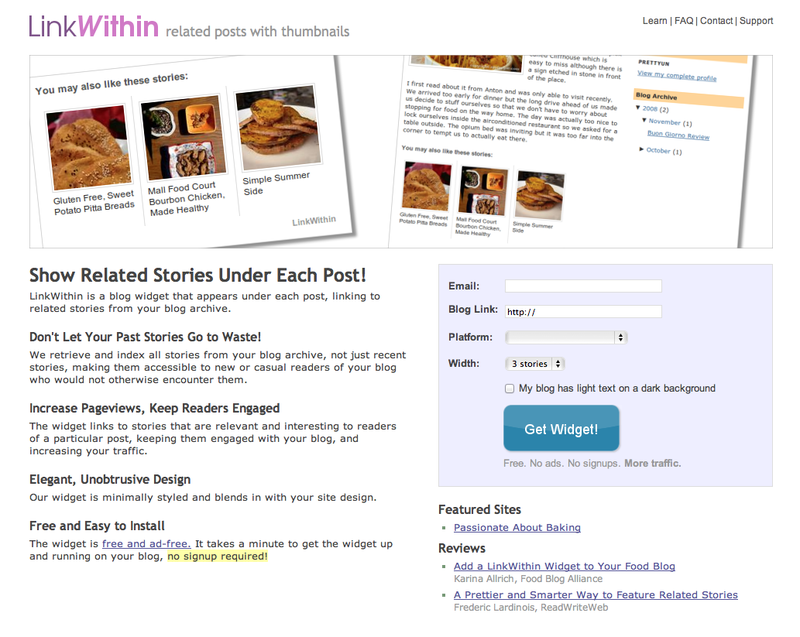 After you provide LinkWithin with your blog information and then you add the gadget to your blog, it will look like this after each post. 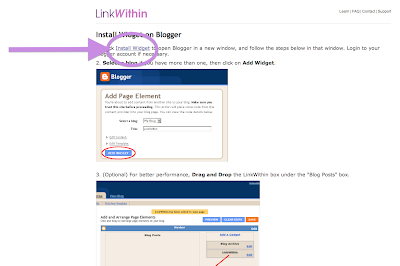 LinkWithin retrieves posts from your archives that are related to the post you just did in hopes that the picture will grab the attention of your reader and have them click to older posts. The purple shaded area is the only info they need...super easy, fast, no sign up or ads. I re-did mine to show you and I changed mine from 3 to 5 in the process. 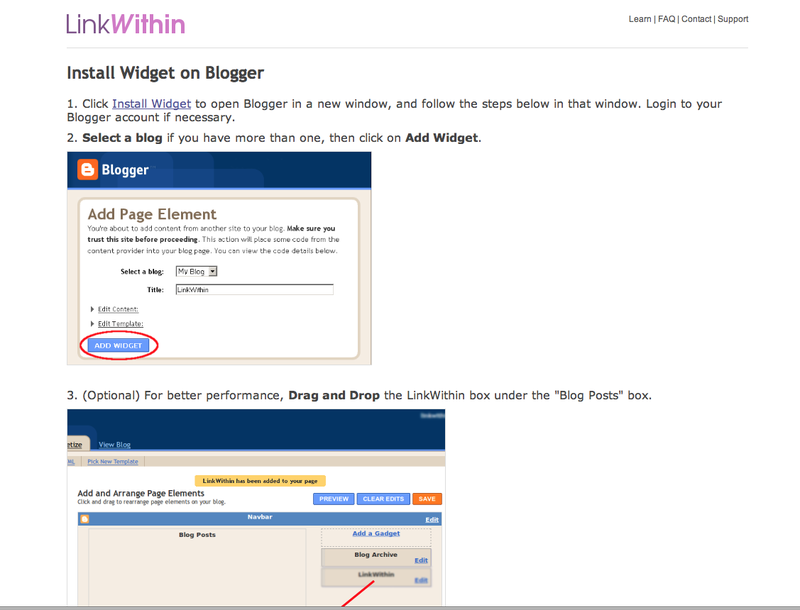 Just fill in your information and click "GET WIDGET"
The next screen from their site looks like this...It's our OLD blogger dashboard look for adding a gadget, but don't worry they just didn't change it...has no affect. The next step is to click "INSTALL WIDGET" circled in purple. 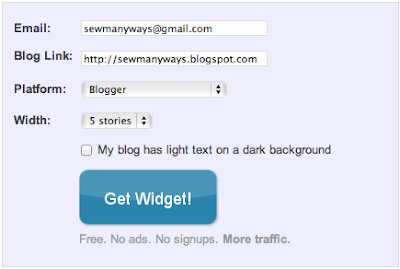 Next screen pops up...click "ADD WIDGET"
The gadget automatically shows up at the top of the list on the right of your layout page on your blogger dashboard. 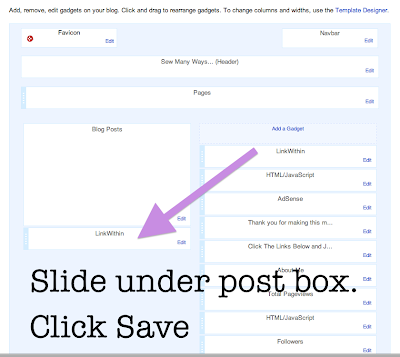 Just "grab" it with your mouse and slide it under the blog post box. This is what it looks like for me now. I switched from 3 boxes to 5. I hope you find this to be an easy tutorial. Seems like a lot of info, but the steps are quick. If you have any questions with the gadget, they have a FAQ and support at the top right of their site. Thanks Karen - this is a nice option for readers. I have used it on other blogs. Thank you, so much, Karen. You always lead me in the right direction. 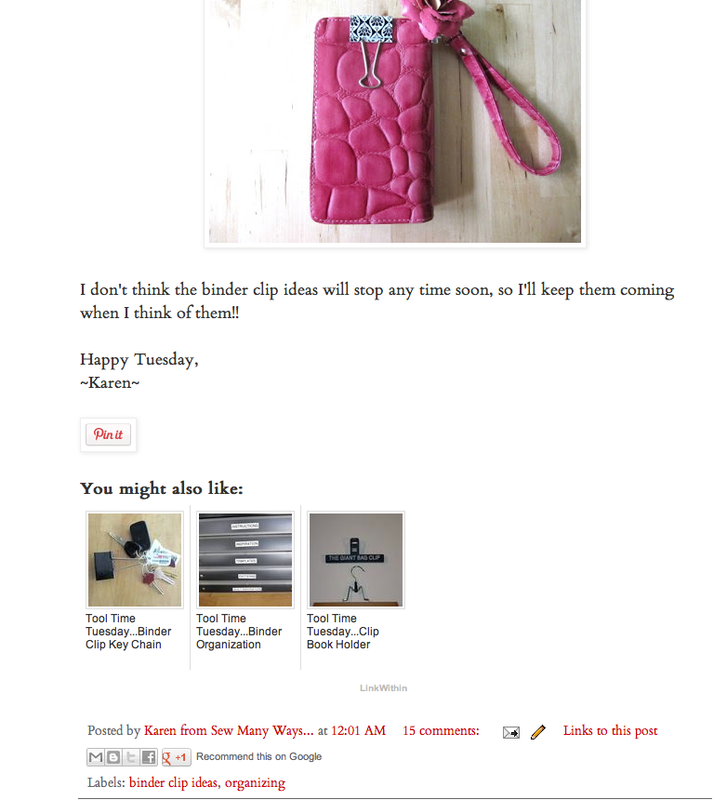 When I started my blog, you helped in "sew" many ways. You rock! I have always wanted this on my blog & now I do ! Thank you, Karen. I have wondered how to get that. You have helped so much in my blogging. Thank you again! Great tip, Karen! 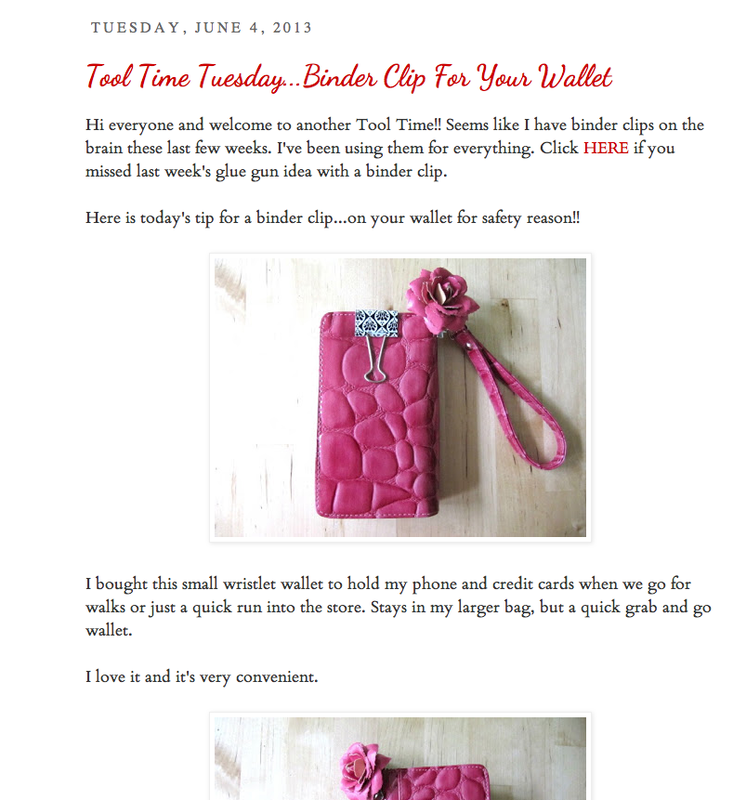 I just added it to my quilting blog and it worked like a charm!! Thank you SEW much! I have wondered how to get this, and have now added it. One question- the previous posts it "chooses to add" is completely random? Or does it choose based on your labels? 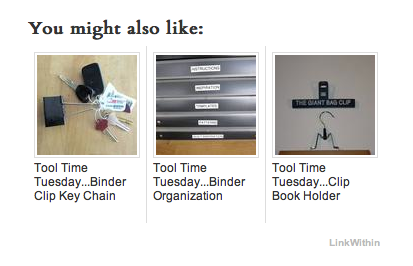 What I got was random, but I expected them to be related - as your pic shows above with all the posts on uses of binder clips and Thrifty Thursday. Did I do something wrong? I'm back. When I closed my blog, and then re-opened, the Linked Within was gone. So I reinstalled it, and now the additions are related to the post. Not sure what I did differently the second time...? 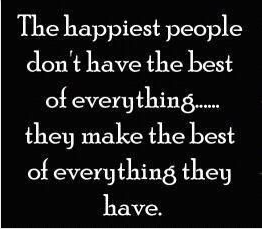 Anyway, I'm Happy! Thanks sew much!!! THANK YOU!!!! As a new blogger, I've been wondering how to do this and couldn't seem to figure it out. Hooray! Now it's on my blog, RedDeliciousLife.blogspot.com. Thank you. I've seen this on other blogs and wondered if I wanted to add it to mine. I think I'll give it a try. 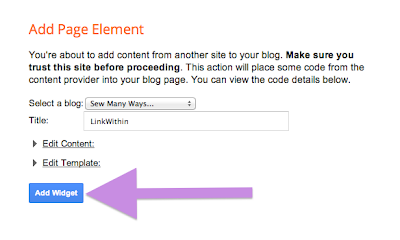 Yet another great blogging tip! Thank you so much for sharing these tutorials. I've learned a lot from you! I did it! Thank you so much, Karen! Another great tip from you, thank you Karen. I am always wondering how more experienced bloggers do all of these little things and I love that you share these valuable tips and tutorials with us. I only have a few posts up being a newbie to the blogging community so wondering if I should maybe wait until I have a number of more posts up first? Got it added. Once again, thanks for the helpful hint. Thanks Karen! I just added it! Erin at Piers and Chandeliers! Thanks so much! I have now done that and I love it. I didn't realise it was so quick and easy! I tried so many times but failed but your tutorials always save me.Thank you so much. 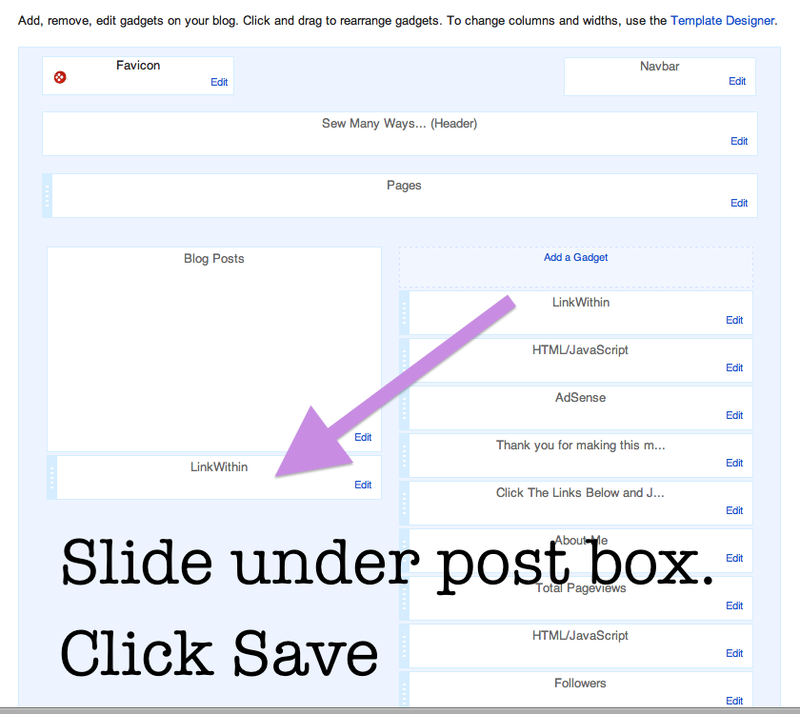 Thank you, I've used it on other's blogs and now my readers can use it on mine! Thanks so much! I have wondered how to do that, and now I have it on my blog, too. Thanks Karen! I love your blogging tips. I follow along with your well written instructions and presto! something new happens on my blog just the way I wanted it to! Thanks so much! I've always wondered how to get the "You might also like" on my blog... :-) Neat feature! This was EXTREMELY helpful! Thank you so much! Great Tutorial! Thank you for the very helpful tutorial!!! It worked great! Thank you so much for this tutorial! I just followed your directions, and it worked perfectly!! !